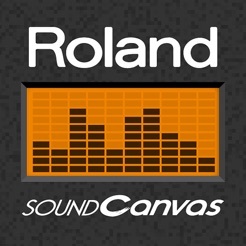 The classic Roland Sound Canvas sound module is reborn as a software synthesizer for iPhone or iPad. SOUND Canvas is a software synthesizer that emulates perfectly the highly popular GS format sound source, along with a bulit-in SMF *1 player for playing Standard MIDI Files. It is based on the Roland GS standard that has been de facto standard sound source, "SOUND Canvas Series" of Roland Desk Top Music (DTM). It is compatible with the sound for "GS","GM2", and "GM". 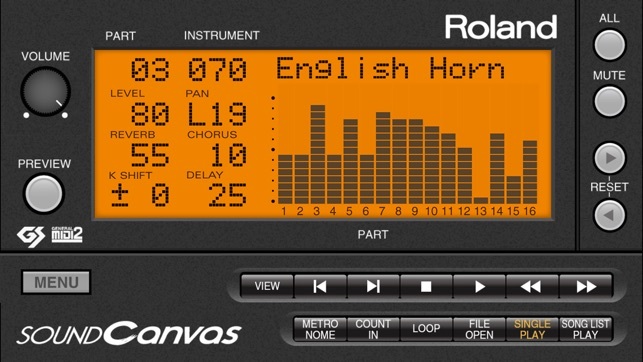 You can enjoy the old data created by SOUND Canvas series and a variety of GS data on the market from Roland with high quality sound. 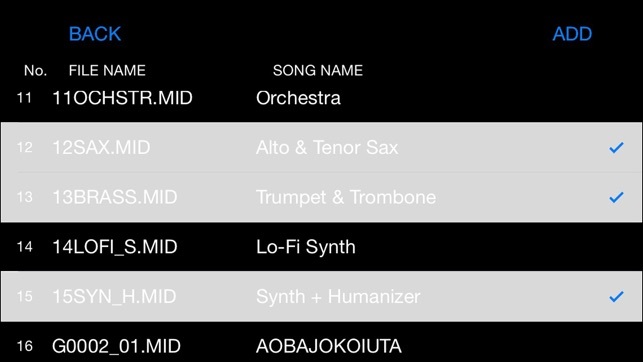 *1: SMF:Standard MIDI File with extension ".mid". The SMF to play in the SOUND Canvas is recommended SMF format 0. -Two types of graphical user interface: “Sound Canvas skin” for music data creation and “Player skin” for practicing with instruments or karaoke application. *Swipe left or right(up or down for iPhone) with two fingers to switch between the skins. - High quality MIDI file sounds by its 1,600 tones and 63 factory drum presets. - Convenient functions:"LOOP" mode to repeat your specifying region, "SONG LIST PLAY" to play sequentially plural songs, and more multifunction. - MIDI interface (separately sold) connection enables to receive MIDI data from the external devices to play sounds. - Available with a music application compatible for the Core MIDI. - Bug fixed when using Master Key Shift. - Bluetooth MIDI device is now selectable directly from the MENU inside SOUND Canvas. Sound Canvas is overall a very decent port of the unit it’s based on, and will play most SC88pro and SC8820 midis you throw at it, and even some SC88 ones depending on the track. No support for multi-port midis, but this app *is* advertised to be 16 part only. Now onto the bugs, most of them are related to background sound. The app by default does not play in the background but does have an option for it. However, the app will not show up on the lock screen as it’s playing music, and sound playing in other apps at that time will not mute Sound Canvas like you’d expect. Looping also doesn’t work if the screen is turned off for whatever reason. Another bug is that the option to select the default map for music only seems to work on drums and none of the other instruments. So for example, if a track uses Electric Piano 2 and you select the 55 map, you’ll get the 8820 EP2 instead of the signature 55 one. 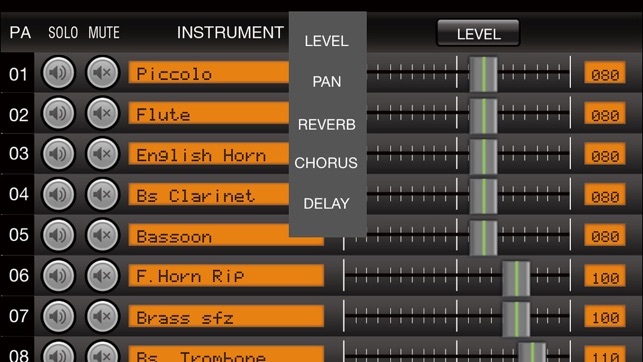 There’s other minor oversights like the dials for some of the effects, such as Delay, showing values from 1 to 127 instead of the real values, which is not the case in the VSTi version of this app, Sound Canvas VA. Speaking of the dials, as of iOS 11.3, I’m no longer able to dismiss them, which is a bit annoying. Overall, this is still a decent app even with all the bugs, but the price is a bit steep in my opinion. 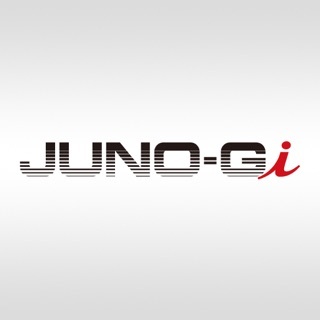 Great collection of instrument sounds. This is the collection of instrument sounds that I use most on iOS. Roland defined the general collection of digital instrument sounds with SOUND Canvas in the 1990s and has been perfecting it ever since. The full selection of instruments is all here and they sound great. Also the collection is highly optimized, very small in storage size and very efficient. It does take some time and effort to get comfortable using the workflow, but there is a very good manual. 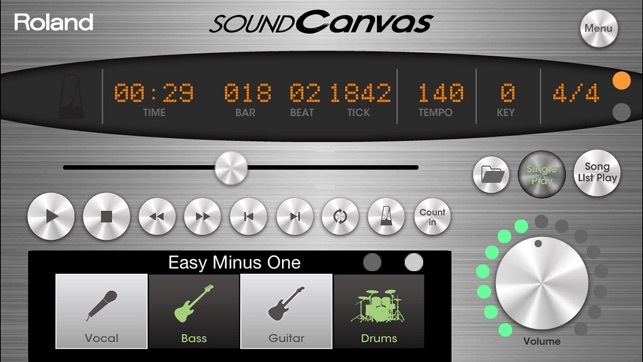 While all apps have room for improvement, and it would always be good to see more developer attention for apps, Roland has continued to update SOUND Canvas over the past several years, including its latest update today. 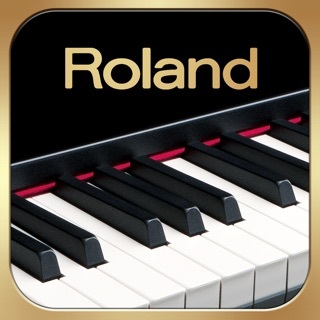 i used to love my SC-55 back in the day, so thank you Roland for bringing this to iOS. as for the numerous complaints about not being able to save settings... READ THE MANUAL. press menu then select help, then go to page 21... it's all right there. i also was able to play the sound canvas live as a sound module, as well as toggle on/off the playing in the background issues stated in other reviews. i can appreciate the frustration expressed in the other reviews, but it's just a matter of knowing how to use it. best of luck to all SC users.